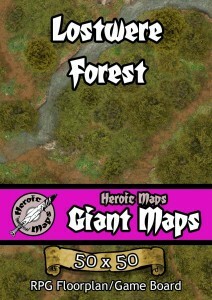 Heroic Maps has a new map set available. This time it's the Lostwere Forest. A printable rpg battlemap compatible with any RPG/Dungeon-Crawl or skirmish game. Use as a standalone gameboard, or combine with any same-scale tileset. The map is 50x50, equivalen to 25 of our standard 10x10 tiles. Contents: A forest map, with various sized muddy tracks and trails. Dense areas of forest and woods, with small clearings and rocky outcrops. A small stream winds through the forest before splitting, and is crossed in two places by small muddy fords. Animal footprints, piles of bones and mushrooms provide ambience and story hooks. Uses: A deep forest inhabited by goblins, an ancient wood your adventurers need to get through before nightfall, the hideout of a group of werewolves that have been terrorising a nearby village, the site of an ambush, the wilderness beyond the mountains. 250dpi A4 pdf, with gridded map spread across 50 ages for easy printing. 250dpi full jpeg versions (gridded and non-gridded), for VTT or poster printing.